Former UT student-athlete and four-time Olympic gold medalist Sanya Richards-Ross, ’04, is passionate about prom. But 14 years ago, she almost missed her own. A senior at St. Thomas Aquinas High School in Fort Lauderdale, Florida, the National High School Female Athlete of the Year Richards-Ross was busy that day with a track meet, rushing to arrive just at the tail end of the evening. Still, she sees senior prom as a rite of passage. This weekend, Ross enabled six underprivileged girls and five boys to make it to their senior prom during the third-annual Prom Glam. Sponsored by Richards-Ross’ charity, the Gold Standard Foundation, the event included dresses, hair styling, makeup, and a limo ride to the prom. Teaming up with her Longhorn husband and two-time Super Bowl champion Aaron Ross, ’06, Richards-Ross also selected five boys to participate in this year’s event. All of the students were from Lyndon B. Johnson High School in Austin and selected based on need and academic performance. Many of the students involved were not planning on going to prom—citing the high cost of formalwear and tickets—before being selected for Prom Glam. Once the students were nominated by teachers, counselors, or peers, they were sized for their outfits. The preparations started seven hours before prom, with last-minute dress updates. As the countdown went on, girls showed up at Richards-Ross’ salon, The Hair Clinic, four hours before prom to get their hair and makeup done. The Hair Clinic was filled with parents, siblings, and friends as the girls got ready, each at their own booth with their name on a sign above. The boys arrived later, with Aaron Ross, already prepped. Before they all took off in a limo for prom, they strutted a red carpet-like walk, taking pictures with family and their stylists. Richards-Ross’ charity foundation also helps with various education and empowerment programs for young girls, including those from Jamaica, where she was born. “I want to give back to the communities that gave so much to me,” she said. Richards-Ross said this year’s Prom Glam was a little more hectic than usual as she is “training like crazy” to prepare for the USA 2016 Track and Field Olympic Team trials. Despite a busy training schedule, she was there for the entire event on Saturday, taking pictures and helping pick out nail polish colors. 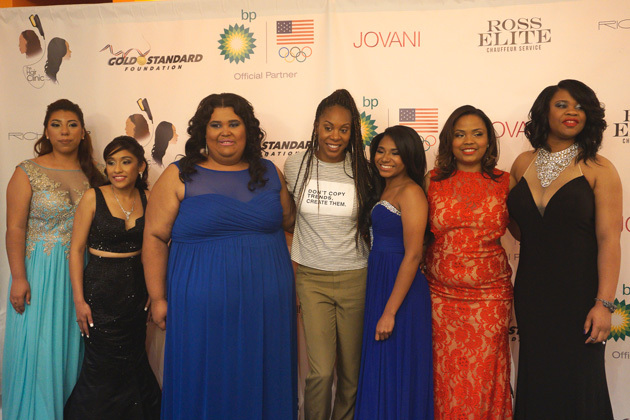 Sanya Richards-Ross, fourth from left, poses with Prom Glam students.